For Chileans whose family members were “disappeared” by a dictatorial regime, some responses seem inappropriate. Images of dancing youth and picnicking families over a commissioned TV jingle don’t seem weighty enough to counterbalance the murder of innocents. C’est la guerre. 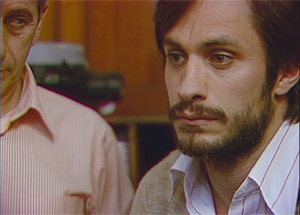 Based on true events, No is about a media campaign waged in Chile against the rule of Augusto Pinochet. But even before you know what’s happening, you’ll notice something odd about No. There are red and green “ghosts” around the images on the screen, along with horizontal stripes. The image is square, not widescreen. The movie seems to have been shot using 1980s video technology. In fact, that’s exactly what director Pablo Larraín and cinematographer Sergio Armstrong have done. They have said they shot on U-matic video (3/4” tape cartridges), once used by newsrooms the world over, so that they could incorporate footage from the actual campaign seamlessly. It’s an interesting decision. Lots of filmmakers choose older technologies to achieve an older look. Quentin Tarantino, Steven Spielberg, David Gordon Green, Miguel Gomes, and Derek Cianfrance are the first five that spring to mind. Still, shooting on early video technology is a bigger risk than shooting on 16mm film or in black-and-white film. I’m not a fan of video, so I was surprised just how quickly and easily I accepted the look of the movie. In fact, I would say I stopped noticing it in a matter of just a few shots, maybe a minute or two at most. Ironically, the High Frame Rate 3D of The Hobbit kept me disengaged for much longer. Peter Jackson: take note. Pinochet had agreed to abide by a simple Yes or No vote on his continuing rule. Both the Yes and the No campaigns were given 15 minutes of television airtime per day. That illusion of balance didn’t fool anyone; the Chilean media companies were all state-run and staffed by cronies, so the Yes campaign actually got about 23 hours and 45 minutes each day. Nobody in Chile believed the vote would be fair, even if their countrymen bothered to show up to vote. Enter Gael Garcia Bernal playing Rene Saavedra, the savvy young ad man who commissioned that jingle for the No campaign, and we finally arrive at the beginning of the movie. Rene works at an ad agency. His boss Mr. Guzmán (Alfredo Castro) is from the previous generation: conservative, connected, strategically minded. When Guzmán hands a presentation over to Rene, it’s less like ceding control and more like showing off one of his talented pets. Of course, that’s not how Rene sees things; Rene moonlights for other clients and defies Guzmán to challenge him on it. They respect each other’s abilities, but they have very different worldviews. Rene is a middle-class citizen. He enjoys trying out the new microwave oven with his son, who has a computer game console hooked up to their TV. But Rene is not so far removed from the victims of Pinochet that he can’t sympathize with the left. His wife (they’re separated, it’s complicated) is beaten by police in a protest, and he is reclaiming her from the police station when we first meet her. So when he is offered the No campaign (behind Guzmán’s back, of course), he reluctantly agrees to “consult” for them. When it comes to the campaign, Rene is a professional. He asks his clients whether they think they can win. If not, what do they hope to achieve? They all have complaints against Pinochet, but Rene wants to know how they intend to parlay those complaints into votes. It’s a little uncomfortable in the movie — as it surely was when it was happening — to see a just revolution packaged as a consumer product. But just as you don’t bring a knife to an armed insurrection, you don’t bring gloomy speeches to a media campaign. Screenwriter Pedro Peirano, working from a play by Antonio Skármeta, tells the story in a linear fashion. It’s almost surprising how engrossing the story is. It’s easy to get caught up in the campaign, to see a good fight being waged on unorthodox terms by a young hero. The movie is at its very best during the campaign. When the campaign ends, as it inevitably must, and all that remains is the voting, the movie loses some steam. It’s not quite as anticlimactic as The Candidate (“What do we do now?”), but Rene does say something like “So that’s it?”. Still, if you don’t know your South American history, you can enjoy a little tension, not just about the outcome but about whether Pinochet will meddle in the counting. But really, the heart of the movie is the campaign, and the many contradictions it spawned, not the least of which is whether a TV jingle can ever be an appropriate response to political killings.